Northern Dynasty's CEO said the comapny is likely to see its Pebble project get the green light now that President Trump is in charge. Shares of Northern Dynasty Minerals (NYSEMKT:NAK) were up 12.5% this morning, after the company's CEO said the company has received backing from President Trump for its Pebble project in Alaska. According to a statement from CEO Ronald Thiessen yesterday, the company has said the new administration is behind the development of the company's Pebble gold project in Alaska. That project has been under review from the Environmental Protection Agency because of a study to the regions fisheries, which also happens to be the world's largest supply of sockeye salmon. The company has been crying wolf for years that the permitting process has been deliberately held up for political reasons, and Thiessen expects the company to get a decision within the first 100 days of the administration whether it can get the environmental green light for the project. The other thing Theissen mentioned was that the company expects to get a new partner for the project by October. This prospective mine is Northern Dynasty's only asset; it has no cash flow generation and very little access to funding. As such, it will need a partner to help finance this massive project. Both Anglo American and Rio Tinto have already walked away, so we'll have to see whether a new partner can be found in such a short time table. As much as Northern Dynasty has been deriding the previous administration about environmental permitting, it wasn't as though the company made progress on this mine in the eight years it was a public company before the Obama administration. One has to wonder if this is all about its political spat, or whether Northern Dynasty can execute its plan. Could the company make a lot of money for some investors if it ever gets the Pebble project off the ground? Maybe. It all depends on whether the mine can produce all in sustaining costs less than the spot price of gold. That involves actually getting the mine off the ground, though. This company's nearly two decades in the public eye have given no indication that it can actually pull this off. 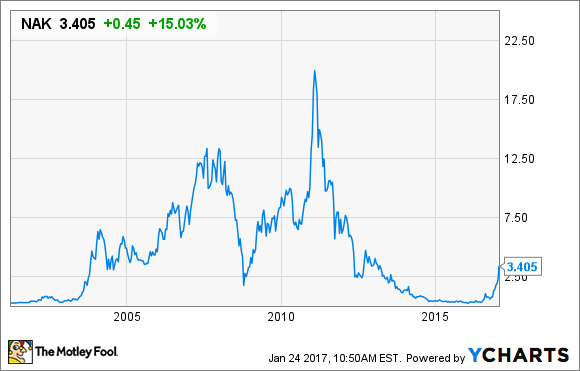 So any investor looking at this stock as a potential long-term investment should be highly skeptical until we see gold come out of the ground.